After our succesfull 1st EU / #2 World place last year in the CQ WPX RTTY, we will try to beat our score and at least keep this rank. 1st place last year was impossible to reach from Europe as points system gives more chances to South American or African or even Asiatic (close EU) contest positions. We did it last year with F4ERS and F4EGD. 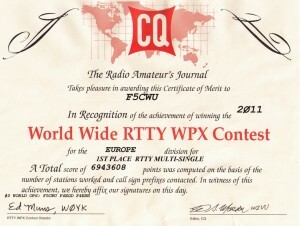 In 2012, we’ll use the callsign F4ERS, still from TM4Q contest station. We did some upgrade to the station setup in 2011 and we hope that we’ll be able to get even more multipliers. 10m will for sure give extra points ! See you in the contest !